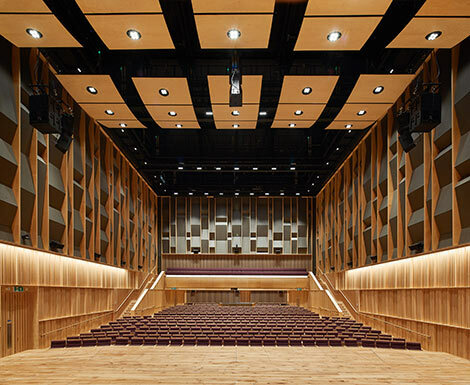 A variety of conferences and meetings can be hosted at Birmingham Conservatoire, ranging from those with a large number of delegates in our 493 seat Bradshaw Hall, to executive meetings or smaller events which you may prefer to hold in a choice of studio and function rooms. The pale wooden finishes of our Bradshaw Hall contrasts with charcoal coloured acoustic panelling and burgundy seats to provide a refined and elegant backdrop for your event. A raised stage platform is accompanied by delegate seating of up to 493 across a gentle rake and small balcony. A flexible space with a level stage area, the light wooden finishes provide a sophisticated atmosphere for your event. 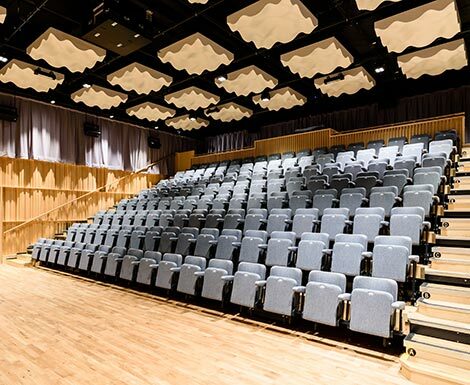 A bleacher seating rake can be extended for conference set-up for 146, or this can be fully retracted underneath a small technical balcony for layouts up to 250 including banquet and theatre style. 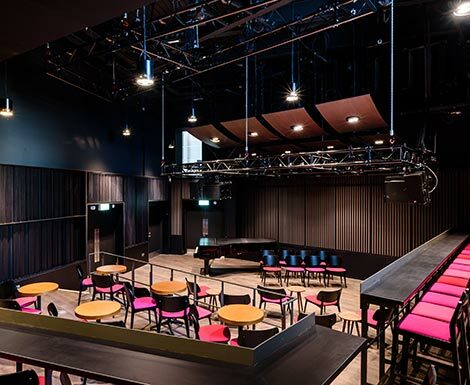 An intimate venue with flexible performance space and removable seating up to a capacity of 100 across 3 raised levels. The venue operates as a completely multi-functional space making it ideal for presentations, keynote speeches, seminars and drinks receptions. The black wood of this venue provides a warm and enclosed backdrop for your event. 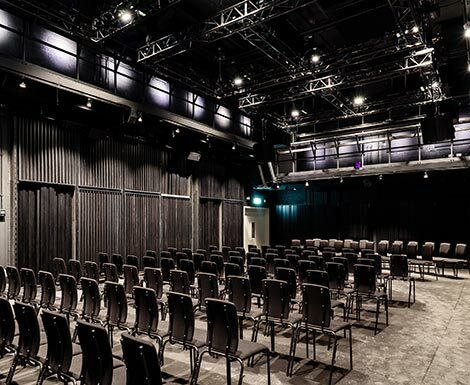 Duplicate input points around the space enables complete flexibility in the set-up and layout of this 150 seat venue making it ideally suited as a flexible audio-visual seminar and workshop space. Our eight spacious performance studios are open rooms designed to enable complete flexibility in layouts including theatre, class room, and seminar or meeting room style. With capacities from 30-60 each room has full seminar and meeting facilities making them ideal for a range of functions. 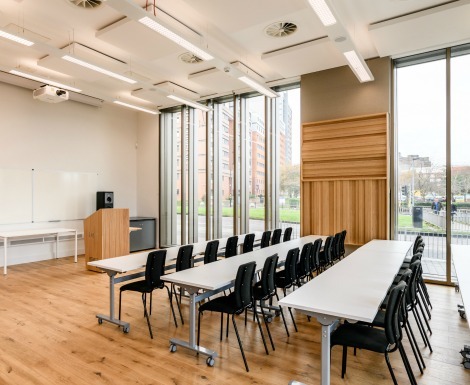 With over 70 practice rooms of varying sizes for groups of 2-20, the flexibility of these spaces means that we are ideally positioned to offer you use of these rooms as smaller meeting room or breakout spaces. Why choose us for your conference or meeting? Inspiring backdrops for receptions and exhibitions can be provided in several areas including the gallery bar with its views overlooking the campus. 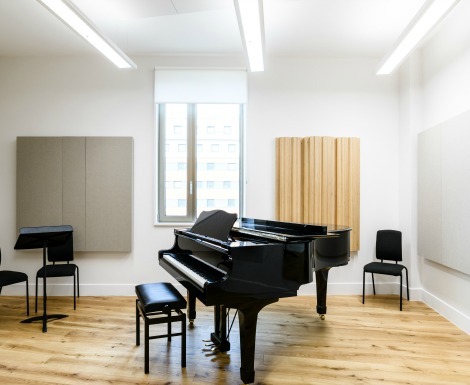 We are the only venue in the city that offers a piano in every room and that can also easily offer live music or small theatrical performance in lunch-breaks, or performance team building workshops designed to meet your objectives, courtesy of our talented students and staff. We have a range of equipment and furniture available to facilitate conference and meeting set-ups, including laser projectors and screens, bespoke digital BOF lecterns, B&W 7.2 - 16.2 surround sound, integrated wireless microphone systems and wireless presentation gateways with Crestron Wall-mounted touchpad control panels. All of our technical facilities are tailored to meet the individual needs of a specific event and all of the usual facilities like tables, chairs, whiteboards and flip charts can also be provided. Delicious food and drink can be provided by our in-house caterers and tailored to meet your specific needs.